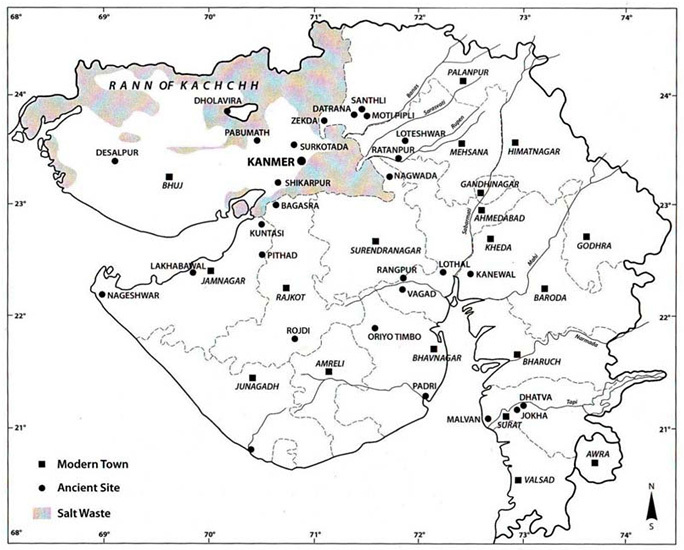 The city of Dholavira (see map), an important site of the Harappan civilization, is located in a small island in the Rann of Kutch. Discovered in 1966, it was excavated two decades later. It was not a small town; extending over 47 hectares, it ranks among the top five Harappan sites. Now new discoveries from this area are changing our understanding of the Harappan sites which were hundreds of kilometers away from the well known sites of Mohenjo-daro and Harappa, but were coastal towns. For example a huge tank like structure was discovered at Lothal, which is about 50 km east of Dholavira. Located near Bhogavo, a tributary of Sabarmati river, Lothal is a small site (7 hectares) which followed the Harappan tradition of wide streets and fortification. The “tank” structure is 217m long and 36m wide and its walls were made of millions of baked bricks. When stone anchors and marine shells were found in this tank, archaeologists identified it as a tidal dockyard. During high tide, boats could sail up the Bhogavo and dock here. The warehouse was nearby and there was a spillway for overflowing waters. Then as with almost anything related to the Harappan civilization, this identification is controversial. Some argue that it was just a reservoir and nothing more. Then shouldn’t a reservoir have slanted steps like in Dholavira or Mohenjo-daro? If it were a reservoir, would the Harappans empty waste water into it? Recently Dennys Frenez of the University of Bologna found some hints that wide canal connected the basin with the sea which supports the theory that the tank was indeed a port. To understand what goods went out from Lothal we need to visit Kanmer. Located close to Dholavira, it had a population of less than 500 people during the peak of the Harappan civilization. The people of this fortified city were involved in bead making — from carnelian, lapis and agate — and exporting. One of the difficult tasks for the bead makers was drilling the small hole for the string which was done using drill bits made of hardened synthetic stone. 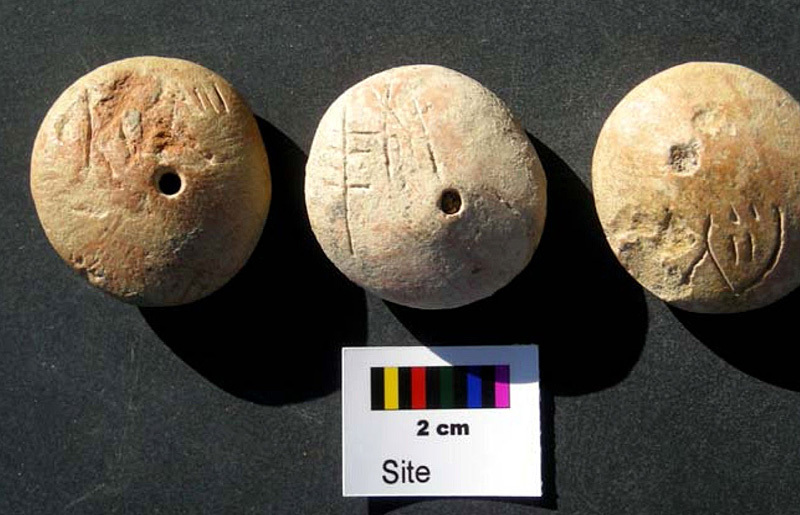 Also found in Kanmer were clay seals with a central hole (see pic). According to the dig director Toshiki Osada, they might be pendants used as a kind of passport in trade. D.P Agrawal et al., Redefining the Harappan hinterland, Antiquity, 084, no. 323 (March 2010).